We are your official guide to all the boating lakes and reservoirs in Arizona. 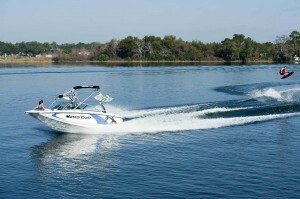 We offer all sizes of watercraft, boats, and tour services provided by Arizona boat and jet ski rentals. We service all lakes in Arizona and there are some amazing bodies of water which are fresh water and many different sizes. Lakes are inland and not part of the ocean, and can be contrasted from rivers, ponds, and streams. However most lakes in Arizona are fed and drained by rivers and streams. Arizona, Nevada, and California have a lot of natural lakes, and also man made reservoirs that are generally found in mountainous areas. Other lakes are found in or along the courses of mature rivers. There are so many lakes in these states because of the mountains and natural drainage system of the area. Check out some of the most beautiful lakes we service with the best in recreational services, and let us know which one you would like to visit for your next water sport vacation.